Here’s a sweet way to exfoliate and reveal glowing, fresh skin! This fabulous Whipped Sugar Scrub from Soy-Delicious has been enriched with luxurious soybean oil and is available in 4 delightful flavors in a 4 oz. container: Karma, Tahitian Orchid, Dulce de Leche, and Havana. Each jar comes with a wooden spoon for scooping out the scrub and applying to your skin as you bathe or shower. Made to pair with Soy Delicious moisturizing candles – simply light the candle while enjoying your bath, and after using the scrub, moisturize with the soy oils from the candle. Pure decadence! 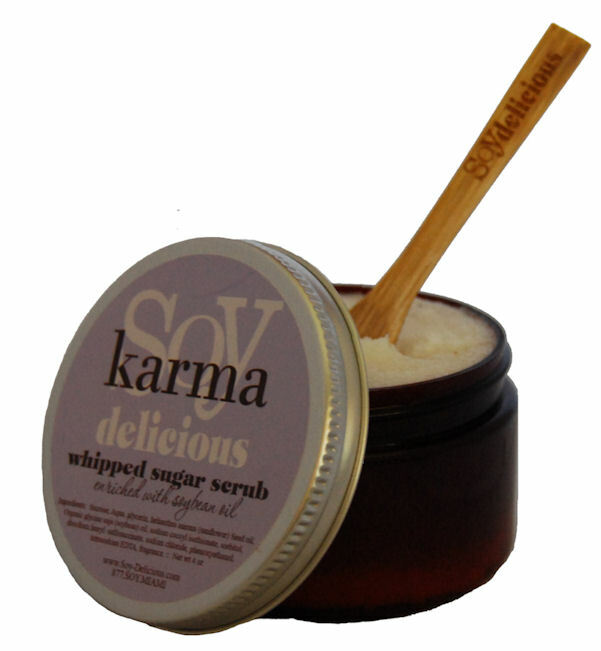 This lovely scrub makes a wonderful gift, especially if given as a set with a Soy Delicious candle. To purchase, visit www.soy-delicious.com.